Singlemode Single Channel 12G/SDI, 3G/SDI, HD/SDI Fibre Optic Receiver Module with Dual Outputs, Auto-Sensing for SDI, ASI, HD/SDI, 3G/SDI and 12G/SDI. Fitted with LC connectors. PS12 power supply ordered separately. 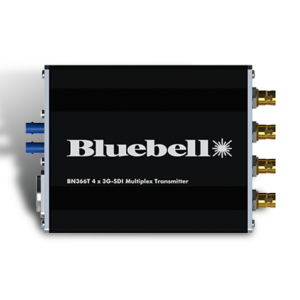 BN365R Single Channel Electrical to Optical Receiver 12G-SDI, 6G-SDI, 3G-SDI The BN365R is a receiver for the conversion of two independent optical signals into electrical 12G-SDI, 3G-SDI, HD-SDI, SD-SDI and ASI. The incoming optical signal is fed to a transimpedance and limiting amplifier before being electrically reclocked on the outputs. 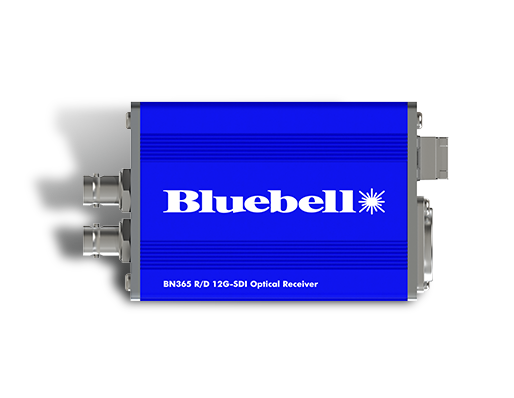 All Bluebell products are designed to retain maximum integrity of the signal path offering excellent jitter free optical transport. 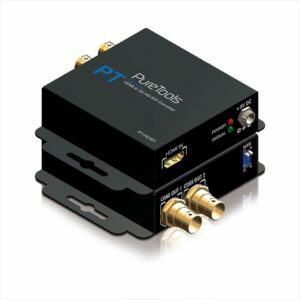 Two serial digital signals are available on each output. Each BN365 is housed in a compact robust enclosure and is designed for Outside Broadcast and special events as well as Studios. Power is provided via the optional PS12 unit. The PS12 has an IEC mains inlet allowing easy adoption into standard equipment bays. The BN365 has a 4 pin XLR allowing power from a variety of external DC sources in the range 4.5 to 17 V. The BN365s are extremely compact single channel fibre optic converters that are perfectly suited to provide interference free transmission and for extending the range of electrical signals, particularly 12G-SDI signals.